Brian and Ashlee Gibson created a crowdfunding campaign on GoFundme.com to help raise up to $10,000 to pay for fertility treatments. Hopeful parents to be are turning to crowdfunding sites to raise thousands of dollars from friends, family and even complete strangers. Campaigns for adoptions and fertility treatments on crowdfunding site GoFundMe.com have raised nearly $1.1 million since the site's inception in May 2010, while this year alone, around 100 campaigns have been started on GiveForward.com. 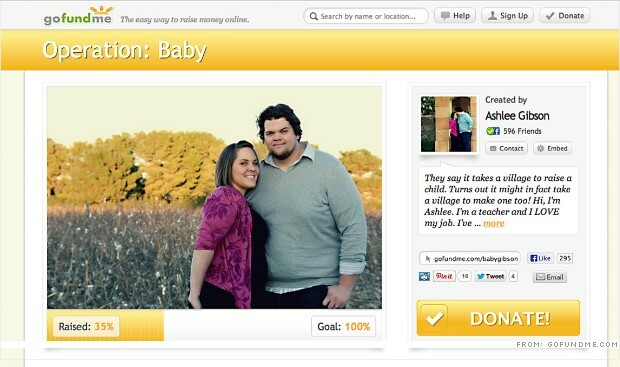 Jessica and Sean Haley's one-year-old son, Landon, is often referred to as the first "crowdfunded baby." In a 2011 campaign on site Indiegogo, the Melbourne Fla., couple, raised $8,050 from more than 130 people that helped pay for their fertility treatments. "Twenty years ago this wouldn't have happened," Jessica Haley said. "Because of the Internet, that's why we have Landon." Fertility treatments can range from an average of $865 for an intrauterine insemination (or IUI) cycle to around $8,158 for a round of the more complicated in vitro fertilization (or IVF), while the medications used between treatments can add thousands of dollars to the bill, according to non-profit RESOLVE: The National Infertility Association. Making matters worse, many couples undergo multiple procedures with no guarantee of success and insurance companies rarely pick up the bill. Only 29% of couples polled in 2012 by RESOLVE said they had received insurance coverage to help cover infertility or adoption expenses in the past year, while more than 70% were dipping into their savings, and nearly 40% were using credit cards. Brian Gibson and his wife Ashlee, spent close to $4,000 on doctor visits and fertility drugs before they decided to try IUI procedures, which doctors told them will cost between $1,500 and $2,000 per month. "We didn't know how we could afford it," said Ashlee Gibson, an elementary school teacher. "I just remember going home and crying." After a friend suggested crowdfunding, the Mesa, Ariz., couple created "Operation: Baby,"a campaign on GoFundme.com in March. So far, the couple has raised $3,700 of their $10,000 goal. Couples who go the adoption route often end up paying even more, with costs ranging from $2,500 to more than $40,000 -- depending on the type of adoption, placement agency and the child's age and circumstances, according to the U.S. Department of Health and Human Services. There are ways to offset those costs. Some employers reimburse adoption expenses and there are nonprofits that offer grants. There's also a federal tax credit of nearly $13,000 per child for out-of-pocket adoption expenses. Yet many people are still intimidated by the expense, said Hank Fortener, a Los Angeles based pastor and adoption advocate. In January 2012, Fortener founded AdoptTogether, the first nonprofit crowdfunding site devoted to adoption. So far, the site has raised $1 million for 300 adoptive families. Thanks to the 501(c)3 status of the site's parent organization, the Hoping Hearts Foundation, all donations are tax deductible. Run by volunteers, its expenses, such as web hosting and credit card transaction fees, are paid through separate fundraising efforts so that funds designated to families go directly toward adoption expenses. Other, more mainstream crowd-funding platforms charge transaction fees, usually around 5%, and additional credit card processing fees can apply. Donations typically aren't tax deductible. Families who don't meet their fundraising goals on AdoptTogether can apply for additional funding. And each family is still required to apply for financial grants through the foundation, providing detailed documentation for each expense, Fortener said. More than 100 families who have used the site already have their children at home with them, according to Fortener. About six months after creating an AdoptTogether page last year, Bill and Nicole Radtke raised $23,000, which covered almost all of the estimated $26,000 they needed to adopt their son Manny, who was born in October. "It's just amazing how much people wanted to be a part of Manny's story," Nicole Radtke said.